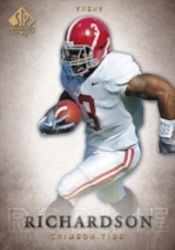 Click here for a complete guide to 2012 SP Authentic Football autograph short prints. Mixing elements from the brand's past with several new ones, 2012 SP Authentic Football is led by the promise of three autographs per box. Among the set's signers are Robert Griffin III, Barry Sanders, Dan Marino, John Elway and Trent Richardson. The NCAA-licensed product has a 100-card base set, 50 short prints and 30 SP Rookie Auto Patch cards, which combine to fall one per box. Tier 1 SP Rookie Auto Patch cards are numbered to 425 while there are 885 numbered copies of each Tier 2 card. SP Canvas variations fall four per box. Every other box has an SP Canvas short print. The base set has an autographed parallel and a Gold Auto parallel (#/15). Sign of the Times signatures, an SP Authentic tradition, return. Basic single-player cards aren't numbered. Dual, triple and quad versions come in varying quantities. Stadium Authentics (1:110 packs) are acetate cards that highlight some of college football's most popular fields. The cards have Bowl variations (1:720 packs) and autographed parallels. 2012 SP Authentic Football brings back the 1994 SP Football design with a 100-card insert set. Mimicking the original set are die-cut parallels (1:48 packs). Every case of 2012 SP Authentic Football comes with four SP Threads bonus packs. Inside each pack is either an SP Threads Rookie Auto Jersey or an SP Legendary Threads Auto Jersey. 2012 SP Authentic Robert Griffin III Kendall Wright Dual Auto! #'d 4 5! Baylor! I’m not a big fan of college football, so my knowledge is minimal at best. I purchased several packs out of curiosity and found that the quality of these cards were far beyond most other sets! I love the simple white back ground and the stock. It has the feel of a high end product. One of my hits I pulled was a Dwayne Bowe base auto! I now have a better knowledge and respect for college football due to this product! I will look forward to purchasing more packs, or maybe a box! I have been watching football from 2009. My knowledge prior to that is next to none! I’ve only started collecting football cards since mid December 2012. So I’m really green in this new but exciting hobby. I try my best to ask question and get educated on all aspects of collecting. May I add that your site was the first for me to inquire on. By far, this is the worlds best place for anyone to get correct and accurate information regarding the hobby. I tell everyone to check this site out! Oh, and I’ve been sending links out as well! My question today is; “How rare is a 2012 Upper Deck SP Authentic 1994 Foil Auto Mark Barron #94SP30”? I’ve seen only one example and its pricy. Why? Thank you in advance, Toshi! We haven’t received an SP Authentic short prints list yet but suspect there should, hopefully, be one in the near-future. We’ll look into it and if we get the info, we’ll be sure to pass it along. Thank you for the 411, I patiently and eagerly await for the SP list as well. If I may, I have a correction on my first review above, it’s not a Dwayne Bowe Auto, it’s a Dwayne Allen Auto. Also from the seven packs I purchased, here are my hits; Rueben Randall Auto 2c patch 360/885, Dwayne Allen Auto #35, 1994 Insert SP Foil Quinton Coples 94SP80, and 1994 Insert SP Foil Auto Mark Barron 94SP30. I will return to the hobby shop and purchase a few Magnetic Acrylic Cases per your sites recomendation “How to” for my hits as well as purchase the rest of the packs that are available! Wish me luck! If I get another hit, you’ll definitely here from me! Once again, thank you for your time and patience! Toshi � Any time! Happy collecting! not much of these (autographed) on ebay so far — are they super scarce or what ? 2/27 still not much — nobody buying boxes or cases or what ? Definitely didn’t know what to expect when purchasing a hobby box of this set. It’s my first buy for pure college FB cards. Normally I stick to NFL and the Topps brand but decided to go out on a limb here. Managed to pull a Brandon Weeden Threads Rookie Auto Tier 2 a few packs in. Card quality is very good and all cards, even base, seem to be worth a good bit from Beckett right out of the box! May try my luck with a second box soon and so far would recommend this for any die hard rookie card collector. 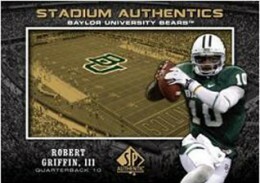 Nothing like having an RG III card with him still decked out in Baylor colors!